I love being around people, chatting and laughing, both in individual and group settings. I get energy from the late night conversations, I love to book meetings where I will get to sit down and have a heart to heart, I look forward to events where I know I will be able to be around people I love. If I am alone for too long I can go stir crazy and will venture to the outside world, a store or park, simply to be around people! Perhaps you can relate... or perhaps you think I am crazy. There is certainly a spectrum of introversion and extroversion, and in this capacity I am quite right winged. Recently I have learned a new term that has reshaped my perspective on the man that I love... 'The Outgoing Introvert'. This is my husband to a tee. If you have ever had the privilege of sitting down and chatting with Brandon, or being around him at an event, you know that he can certainly be the life of the party. He brings the energy, comes up with the crazy ideas, and is willing to chat with anyone. He truly cares about every person he meets, striking up conversation and pulling each person into anything that is happening. And yet, he is a total introvert. You see, introverts are not just the stereotypical people who hide away, recluse to their home, and never want to talk to or engage with other people. Yes, some certainly are like this. But what I have learned about introversion (and as an extrovert, it has taken some time to fully grasp this) is that there is such a thing as being an extremely outgoing introvert, to the point that others may not even believe you are an introvert. Perhaps you too are in a relationship with someone who is an outgoing introvert. It took me the first couple years of our marriage to really learn how to mesh extraversion with outgoing introversion. It has taken some time to understand boundaries, to give space, and to respect the need to slow down. Yes, Brandon can certainly be the life of the party, but he’s not about to head out to an after party. What I mean by this is that too much of a good thing is, well, just too much. Instead of feeling energized by the conversations it can turn exhausting and space for recouping is necessary in order to be able to function well again. I love the company of others. If I am going to watch a movie, I want to have someone there to watch it with me. Brandon is totally capable of getting away by himself with a good book and staying there most of the day. Now, this doesn’t mean that interaction isn’t a good thing. Yes, let me talk to the Starbucks barista but then let me find a couch and open up my book for a couple hours to refresh. Most introverts might agree that on a Friday night they like the idea of staying in better than going out. I am the complete opposite. And yet, I know that once we are at whatever destination we have planned, Brandon will love it and love the people he is with. It is just about getting there. It is also about leaving room for compromise. Packing the weekend full of non-stop ‘fun’ (as I would call it) is not his idea of a relaxing weekend. We might spend the day out with friends but then at night, I need him to pull me back (usually onto the couch) so we can have a night at home to recharge. It is important that you get to know yourself and your partner. Even just understanding simple things about one another and respecting those differences can tame down many potential arguments. Choose to love the person exactly how he or she is, without always choosing to do things the way you think is best. Even if you are not in a relationship, learn more about yourself and be willing to articulate that to others. Don’t let your extroverted friend think you are a drag just because you don’t want to go out for the third night in a row. Be able to share your needs, claim your space, and do what it takes for you to do your best in the situations you face. 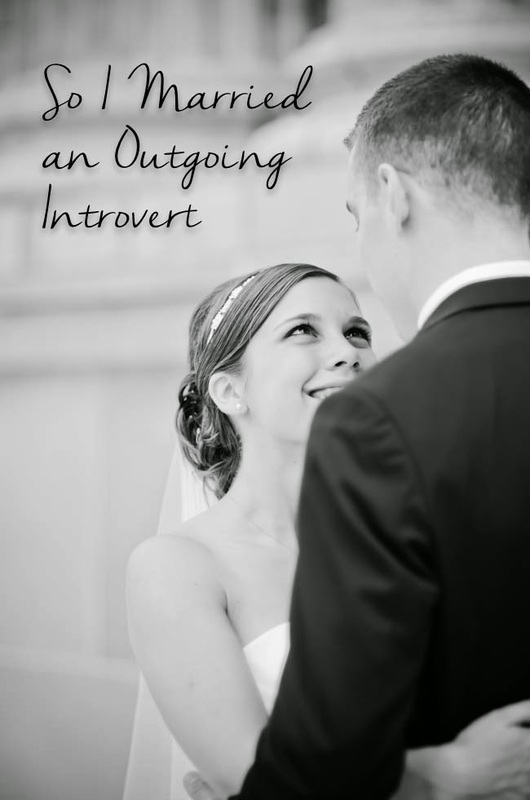 So I married an outgoing introvert... and I couldn’t be happier.